Jack's Ultimate Steak Marinade - steaks marinated in red wine, chili sauce, red wine vinegar, Worcestershire sauce, onion, garlic, salt, pepper and a bay leaf. 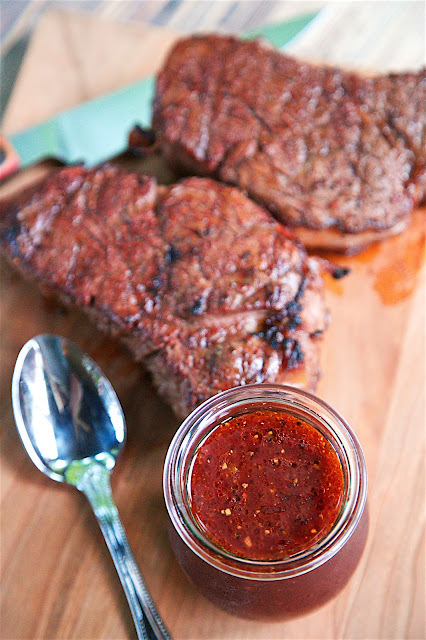 This marinade is seriously delicious! Our new go-to marinade. TONS of great flavor!! We grill out steaks a lot. I actually prefer our home cooked steaks to fancy steakhouses. Chicken Legs seasons and cooks them the way I like it! This recipe comes from Jack Nicklaus' new cookbook. I saw this recipe and wanted to give it a try. The base of the marinade is red wine and chili sauce. It was so different than our usual marinades that I had to give it a try. We whisked up the marinade and let the steaks hang out in the fridge all day. 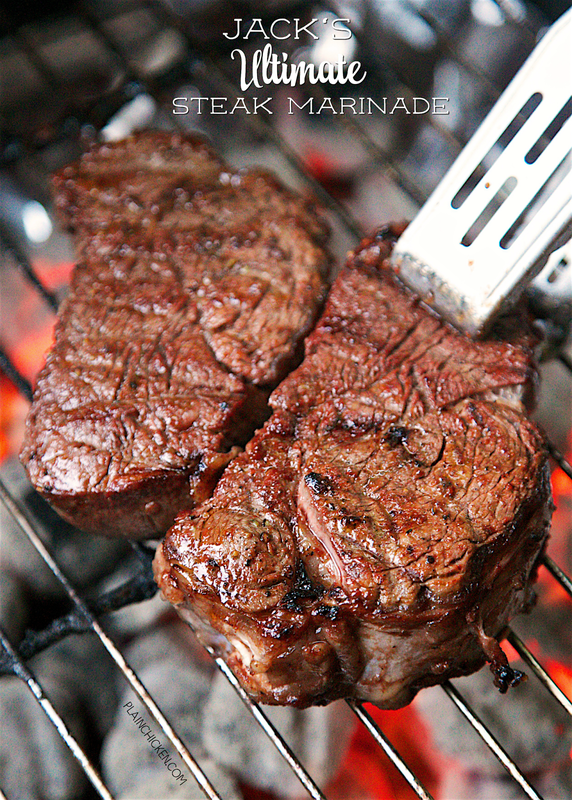 We grilled the steaks, but you can also cook these in an iron skillet. Steaks in an iron skillet are crazy good! You can get instructions here - http://www.plainchicken.com/2010/09/steakhouse-filets.html. This was really, really good. We loved all the flavor from the marinade. We will definitely use this marinade again. 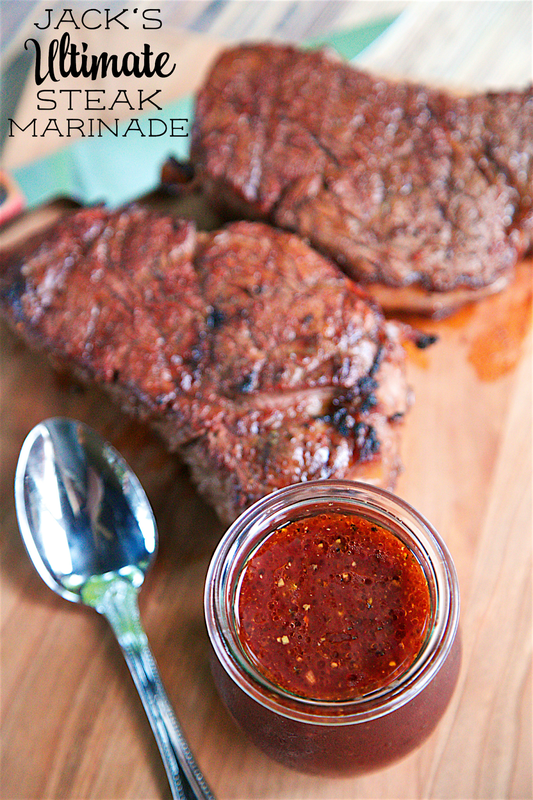 It just might be our new "go-to" steak marinade! Whisk together all ingredients and pour over steaks. Marinate in refrigerator an hour to overnight. 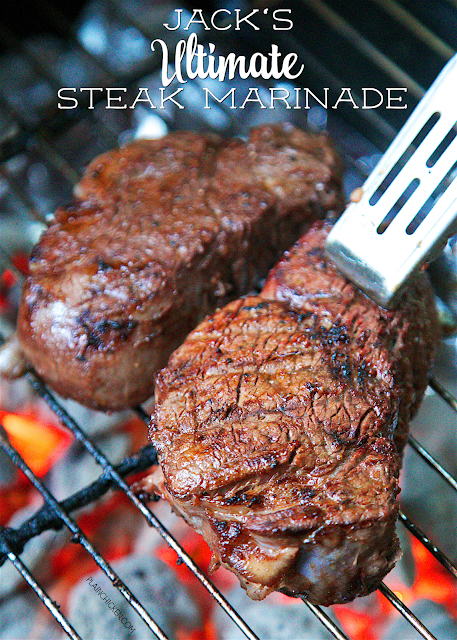 Remove steaks from marinade and cook to desired temperature. What kind of red wine and chili sauce do you recommend using for this recipe? I would use Sriracha Hot Chili Sauce and maybe Cabernet Sauvignon. Oooo this recipe has got my mouth watering! I need this on my plate, with a corn on the cob and a baked potato to keep it company! So, I meant what I said! I needed this on my plate, and I had this on my plate! My husband and kids chose a ribeye and I chose a NY Strip Steak. This marinade is AMAZING!!! I loved this so much, and it paired so well with the wine I bought specifically for this dinner, that I am including it and a link here on my next Wine Pairing Wednesday post which is this week on the 28th. Everyone should have this! Thanks again Stephanie for yet another wonderful recipe! Is the chili sauce hot chili sauce, like Siracha or ketchup based, like Heinz chili sauce, that I use to make cocktail sauce with?